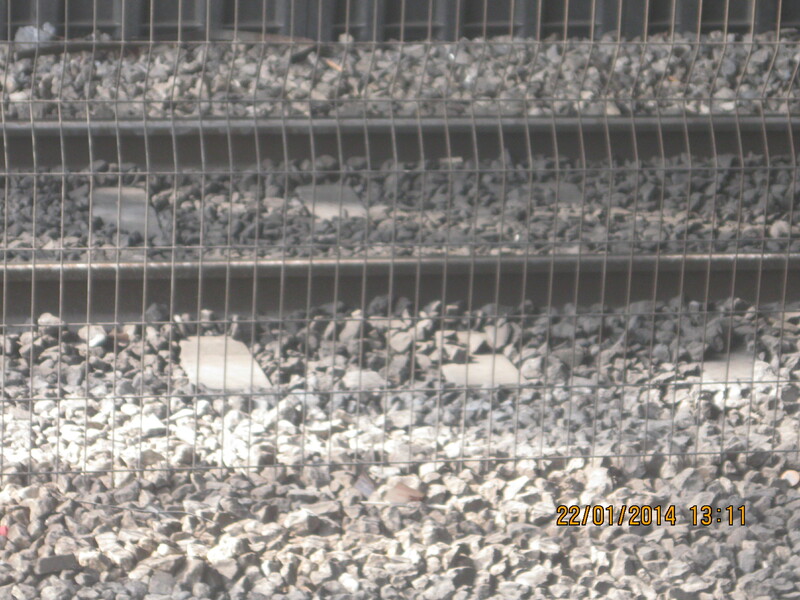 A rail bed. Nothing special, but I like how the shot turned out. Bicycle and wheelchair access car. 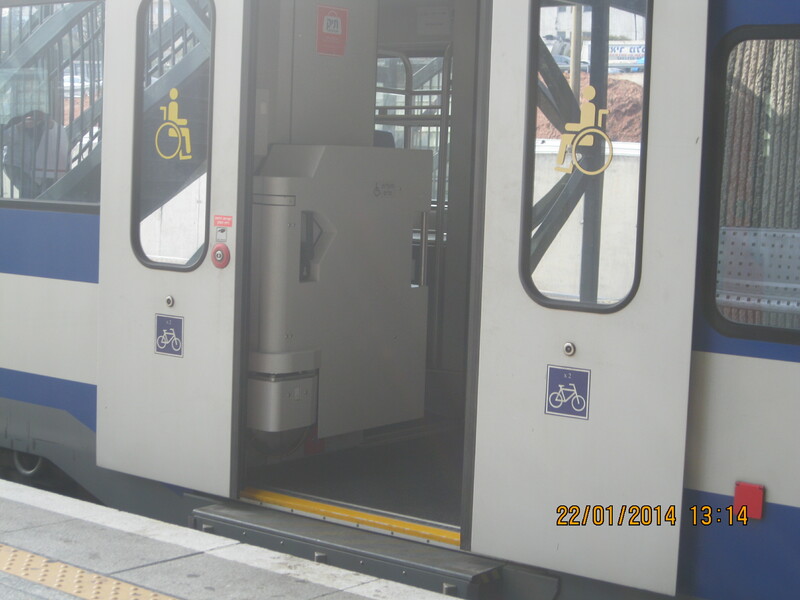 The box seen just inside the doors is a wheelchair lift, but it is not used because “not all the crew at all the stations know how to use them, so we don’t use them to avoid confusion.” … You can’t make these up. This car is designated for bicycles but not wheelchairs. I was put into a couple of these over the week. Train entering the station. You can sort of see the driver in the front car. Unfortunately my strength ran out this week, and I didn’t get out again for another train trip. Planning on one next week and in the meantime I have more photos. So there we were, Friday, racing back to Sderot with all due speed. We didn’t need to change trains, and everyone one the train wanted to get home, too. At Sderot the lift was waiting for us and they were hurrying us out of the station with all due speed. Very friendly, but firm. Everyone wants to get home Friday afternoon. 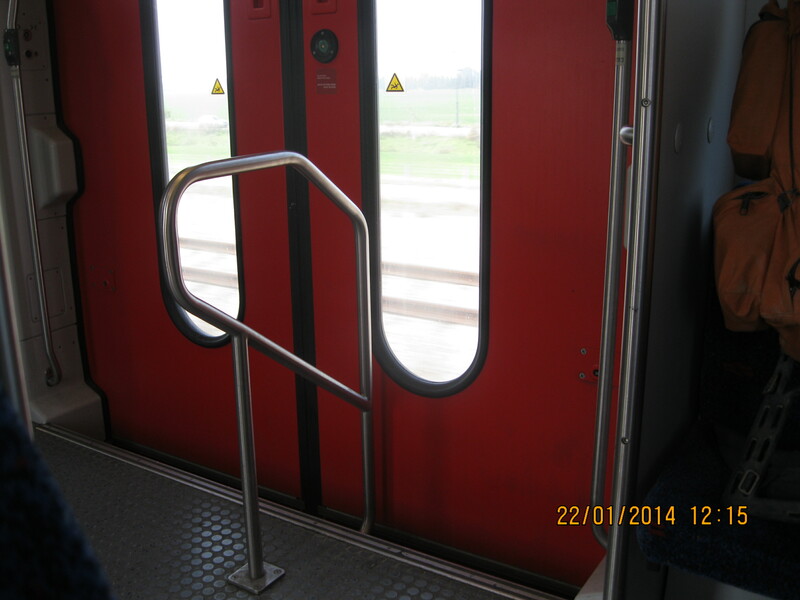 I did use the water closet on that last train, and may I say it was a delight? Plenty of room, grab bars, room to roll in the wheelchair to the sink, everything at a good height. Okay, it wasn’t exactly clean and fresh smelling, but it was at the end of the journey at the end of the day. The button that opens the door outside doesn’t correspond with the buttons on the wall that open, close and lock the door. I didn’t lock the door, not even knowing how to close the door, leave alone lock it. TH showed me afterward. I did managed to do it all by myself, a treat for me – for those who might not appreciate it. Why can’t they all be built like this? We had been able to find out that the last train out of Rosh HaAyin would arrive at Ashkelon about forty-five minutes after we reached Sderot. Time for a mad dash. TH drove us all home to our tiny little moshav in the middle of nowhere. He and my oldest son would do all of the last minute shabbot preparations and get the food on while I drove to Ashkelon to pick up S. (Shhh! don’t tell, I don’t have a license.) Since I can’t do any of the cleaning and preparations at home and I *can* drive, it was the best allocation of resources. As a general rule I don’t drive since they took my license away. I didn’t lose it for any reasons that preclude me driving, the office of licensing (my best attempt at translation) took it after I failed to get several doctors to fill out reports in one month during the chagim (High Holidays) last year. In the process of rectifying that now and generally I don’t drive but this was something of a special case. It was stressful, and manic, and a bit insane, and we drove for a long while before we could turn around, but S and I made it home in time to relax a little bit and change before lighting the candles. The pitot that S had rescued became pita pizzas that night, and the challah was of course for all of shabbot. More on all that later. Thanks for reading. 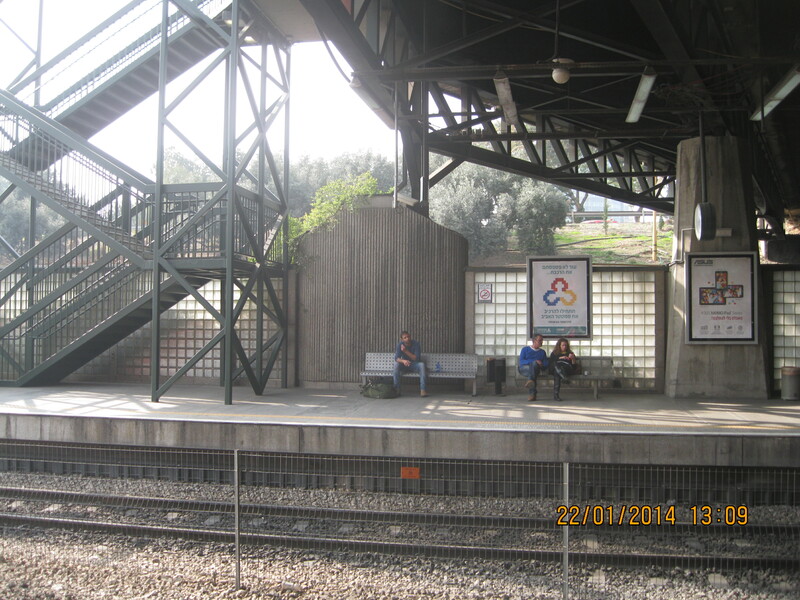 Sitting in the train at Sderot – it feels entirely different going for a day trip – not so much excitement, and no fear. Watching a giggle of girls at the foyer of the car desperately hpoing they go up. It’s a double-decker train with the wheelchairs and bicycles downstairs. 9:02 train leaving. The firls are upstairs thank goodness – we can still hear them perfectly clearly. We have the whole lower level to ourselves now. It is still winter but starting to warm up a touch. Fields in all different shades of green and freshly ploughed fields the colour of terra cotta, or brown. We just passed Yad Mordecai. The scenery cannot compare with the most gorgeous places on earth, or even in Israel, but it is home and it is beautiful. Slowing down for Ashkelon literally hundreds and possibly thousands of cars parked in rows and reflecting the sun. There is an old house with crumbling roof that is the old station house from British Mandate times. I hope I can go see it properly sometime. Still between fields but now iwth the occasional factory or warehouse. Heading for kvish (highway) 4. — And there it is on our right. 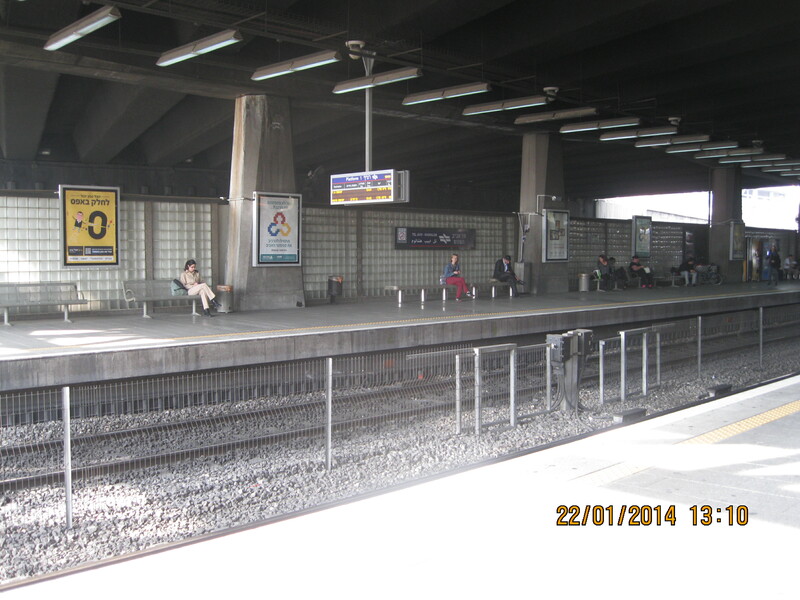 Just pulled in to Yavne – Maarav (Yavne west) station. Realizing with a huge sense of relief we don’t have to change trains! Yeaaa!!! Can’t see much from the Yavne station platorm. Maybe another time. Takana Rishon L’tzion Mosha Dayan appears to be underground but I think it is just the massive amounts of concrete everywhere. Yup, not underground – they built the actual station right over the tracks. I wonder why? Bat Yam Commiyut likewise appears underground. Holon Wolfson has tall concrete walls but bright sunshine shining down anyway. Very nice looking station. That’s the end of my notes, but the day was filled with fun and excitement. My youngest daughter Simcha joined us on that trip so there were four of us. 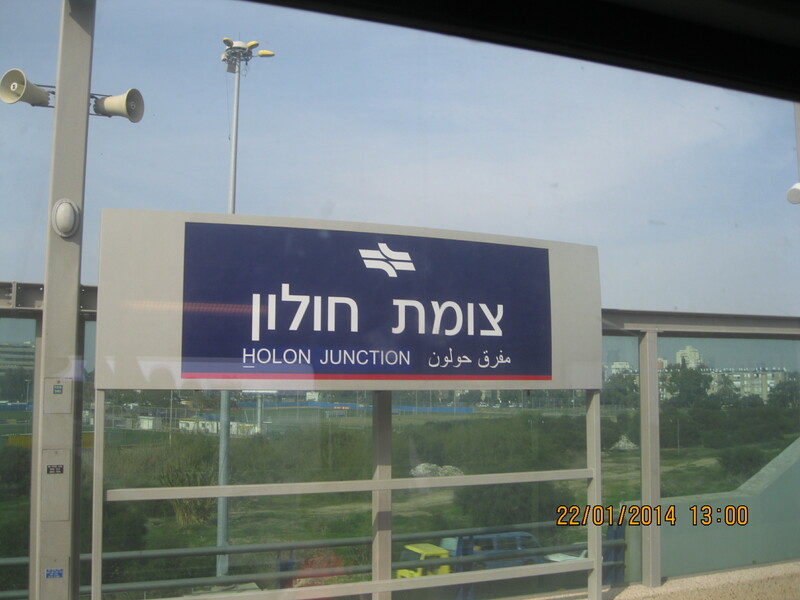 We got off at the Rosh HaAyin train station, which is nestled in a corner of a meeting of highways. Years ago we lived just down the road, effectively, from Rosh HaAyin, and had been to the station and the shuk there more times than I can count so it wasn’t new ground. Still, the wheelchair made a difference as did not having a car. Leaving the station we found a taxi driver and asked for a ride to the shuk, haggling the price down from 38 to 30 shekels. Not any kind of a big deal, except that T(he) H(usband) despite almost ten years in Israel can’t haggle to save his life. Really he can’t. The taxi driver turned in to the parking lot by the shuk where the handicapped parking is, thinking he would drop us there and leave, but there was an attendant at the entrance who argued with him – I guess the attendant was afraid the taxi would park there or something? *I* don’t know. It was in Hebrew and a typical Israeli interaction which left TH and the kids and I getting out of the taxi at the entrance to the parking lot furthest from the shuk. The taxi driver wasn’t happy about it, the attendant wasn’t happy about it, but we figured we could walk along the sidewalk and get there so why fuss about it. Visiting the shuk was wonderful, both for the memories, and because we were there with no constraints, no list of produce we had to buy and get home in time to prepare for shabbot. We just wandered where we could – I took it as a sign if too many people were blocking a ‘street’ (the aisles between the stalls/shops) that we should go some other way. We listened to music, ate pastry, I found shoes I can slip on without help that fit and don’t hurt my injured toe. That is a long story, the injured toe, and not worth the telling. We bought a bunch of fruit and some veg and challah and pita and we found some packages of American bagels (that’s what the package says) and bought trays and trays of fried chicken and egg rolls and potato borekes and other things I don’t know the name of that contained chopped turkey and onion rings and chicken fingers. I’m sure there were other things but that’s a good representative sample. We bought iced drinks, lemonana and coffee. Lemonana is lemonade with the herb nana, which is a mint. Very tasty. We walked up towards the entrance to Rosh HaAyin trying to find a taxi back to the train station. Never found a taxi, but we found a bus stop and a bus to the train station was arriving shortly, so there we waited. The bus was more of a very large van. It was ‘handicapped accessible’ in that there was a piece of the floor which could be lifted on hinges and laid down to form a ramp. The person in the wheelchair has to sit backwards to use the seatbelts. I chose to sit forwards which required some extra maneuvering of the wheelchair but gave me a less unpleasant ride, even though I couldn’t face any of my family members who were riding behind me. At the train station we took our chicken and eggrolls and borekes and, … and found a nice place to sit in the sun and have a picnic. The fried chicken is really excellent and is a reason to go to the shuk all by itself. My taste buds may be a bit effected by living almost ten years in Israel, but I have to tell you that fried chicken is not something that is easy to find here and so finding good fried chicken is no small thing. We cleaned up after ourselves, entered the train station and boarded the train, heading towards home. We hadn’t been more than a few minutes along our way when an extremely upset train conductor came up to us asking if we had left bags behind at the Rosh HaAyin station. Forgetting your bags in Israel is extremely serious. There is too much history here of people finding bombs in wallets, bags, and even bread left lying around in places like busses and train stations. Son E was holding the bags with the picnic and the bread and had forgotten to take them in the dash to get me on the train. Add to that we were on the last train to Sderot, and it was late enough on a Friday that we couldn’t just go to another bakery to buy the challah and pitot (pita, plural), and it was really a bit of a pickle. I thought quickly and asked daughter S if she would get off the train at the next stop, go back up to Rosh HaAyin to get the bags, and take the next (last) train from Rosh HaAyin. We had no idea how far that last train went or how we would pick her up. The train conductor’s brow cleared at that. The forgotten bags were no longer a problem, for him. TH and E and I continued the ride back to Sderot with no further excitement but that of trying to figure out how we would manage with one car and very little time before sundown and my middle son wanting to be picked up from Netivot and TH and the food that we had needing to get home to have some time to prepare for shabbot and somehow having to be able to get S from wherever she was going to end up. 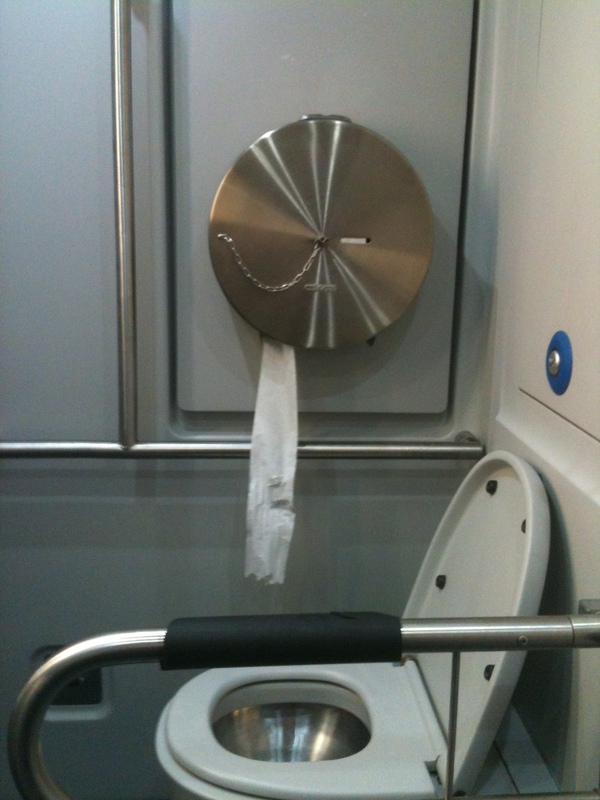 Not very exciting, a toilet on a train. 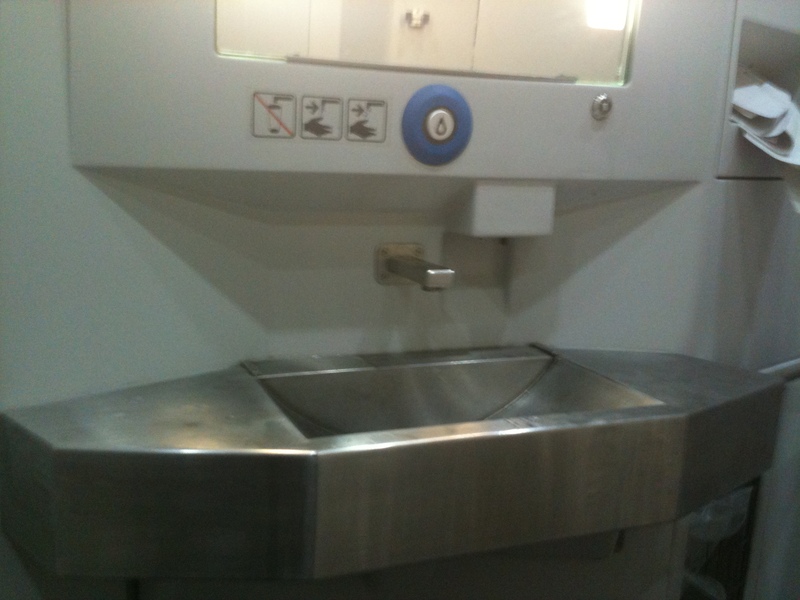 And here’s the sink, oh boy. The trains that run to and from J’lem all have the cars with the luggage nook/wheelchair seating that I found so offensive. I chose on the ride out from J’lem to sit in regular seats which was easy enough to do as we were early on the train at it’s beginning. It was a quiet enough ride, and I’ve already blogged about it enough already but I need to add that once again the bathroom was unusable. There were three days in a row in which I spent more than an hour in need of a toilet and unable to find one I could use. One day I was actually able to make use of facilities exactly three times for a whole day. Thank goodness it is winter and I can choose not to drink for long periods of time. The trip from J’lem to Modi’in was really quite pretty, but not much else to say about it. We arrived at Modi’in to find out that the station was quite in the middle of nowhere. A handful of residential towers at a distance, and nothing else. TH and E and I had brought some food from J’lem, and went outside, found a bench by a pretty flower bed and had a bit of a picnic. It was really extremely pleasant, and even if we saw nothing really of they city of Modi’in, we did not consider the trip a waste. It was fun. 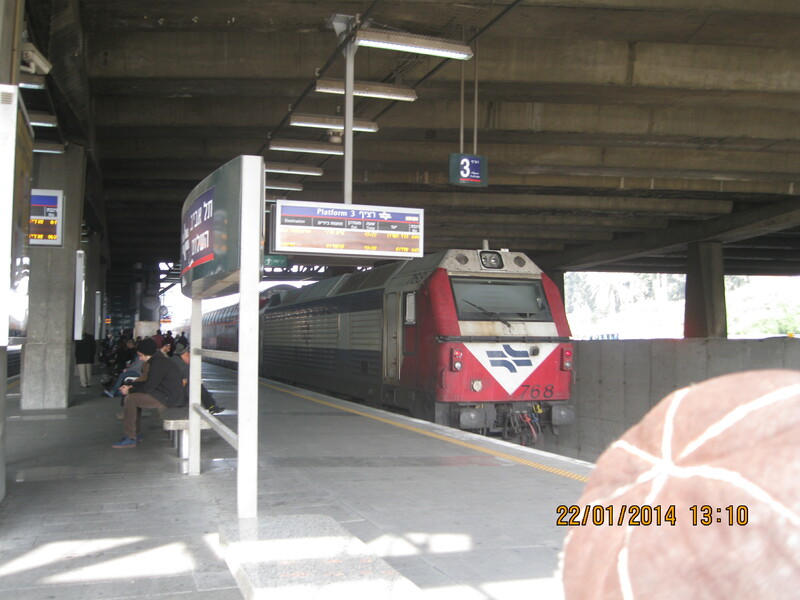 From Modi’in we got on the next train out and, changing trains again at Tel Aviv HaHagganah (the posh, posh, traveling life, the traveling life for me…), we went south via the other southbound line to Be’er Sheva, changing trains at the university station (north) for Dimona. By the time we got to Dimona it was dark, and the station there was completely removed from the city, being at a distance of some kilometers. One difference on this southbound line is that sitting and watching the miles go by, the land is flat. Almost completely flat and almost completely empty. When it gets dark it is actually dark (okay, always a bit of light pollution, but darker than anywhere else I’ve been in Israel), and the lights seen in the distance are a handful of lights on a road intersection, not the glare of a city. The people at the Dimona station are very friendly, and amused by our showing up only to turn around and go back on the next train. We stroll around outside, and I took a handful of photos inside the station using my phone. My photography is nothing special, but I do think seeing things makes it more interesting and real. And so we rolled in to the Be’er Sheva merkaz station (merkaz means ‘center/centre’) and off the train where our oldest son was meeting us to drive us home. I should probably have noted that we live on a tiny little moshav in the middle of nowhere, with no bus service even. And that was the end of the great train tiyul around Israel for us. But, since we had plans to go to Rosh HaAyin the next day, not the end of our travels. Loads of photos coming later. I feel really badly that I didn’t get anything written for a couple of days now. I desperately wanted to because I fear that I will forget things, and of course nothing is fresh. Here’s my hand-written notes from Wednesday, the fourth day of our trip. Very frustrating. I am glad there is no more visiting with people on this trip. Yesterday we only made it to two (2) train stations, I didn’t manage to keep track of money spent, no proper blog update and the personal care situation leaves a lot to be desired. I wanted to visit, but it doesn’t work with me having to always choose between my needs and desires and the needs and desires of family and friends. Unfortunately I need more time, care and space than people outside of my immediate family seem to be able to grasp. On the train from J’lem. I really had a wonderful time but it was too much. We met with a friend at Beit Shemesh and talked rapid fire trying to get the most information out in the shortest possible time. The track from Beit Shemesh to Jerusalem (and back) is full of curves and ver bumpy. Stunning views out the windows. Just gorgeous. It is a long trip for Israel – 1/2 hour between stations. The land is old, worn, but retains a certain majesty. It has seen it all and the hills stand tall. In J’lem I visited with a friend I haven’t seen in a few years and we slept overnight with my brother. He lives outside J’lem on a hilltop yishuv. We took a bus back to the train. It was a fun trip but impossible to write on a bus. Our next destination is Modi’in Centre. Changing trains at Tel Aviv HaHagganah. I pushed forward into a regular cabin and commandeered a seat. Had to ask a young woman to move because I can only reach the first set of seats. Right now I am just enjoying the scenery. Coming into Ramla the wifi stops working. *sigh* A wall prevents me from seeing out. It isn’t an unattractive wall but still. I believe we change trains soon. Ooh, past the wall and suddenly the sun is blazing in my window, almost blinding me. We finished Farmer Giles of Ham. Lod Station. Nothing remarkable except an awful lot of tracks calving and (I can’t read what I wrote – heading?) off to what I’m guessing are train yards. The people at the station in Jerusalem were absolutely marvelous. I am really amazed at the quality of service. I’ve met with a certain measure of native Israeli grumpiness, and there was one station where the employees were generally unhelpful and charm free, but overall the feeling is one of surprized delight. Surprized because I am delighted. Service is not ordinarily something one gushes about. One complains when it isn’t good enough but otherwise one takes it for granted. The Jerusalem station is below street level, and we had to maneuver around quite a bit to get up to the street and onto the sidewalk. Some more curb cuts would be nice. Still, we managed to get to Malka, the Jerusalem mall (that’s what one sign said.) We were met by my old friend who kindly drove TH and E to meet with my brother. They rode home with him to his apartment and my friend showed me some lovely parts of Jerusalem. She loves the city and I hope I can get back so she can show me some more part of it that I haven’t seen. My experience in J’lem so far has been really unpleasant between traffic, parking, inaccessibility of just about *everything*… This was a treat. The bus ride back to the city was such a treat! And the bus ride across J’lem, as we had to get from one end of the city to the other to reach the train station. At that point my cat Kitten decided to move onto the keyboard. More in another post.